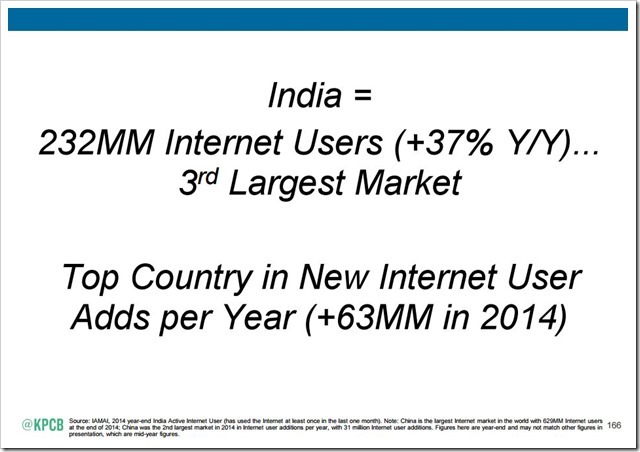 Mary Meeker's Internet Trends Report Confirms India On Cusp of Internet Penetration Explosion! 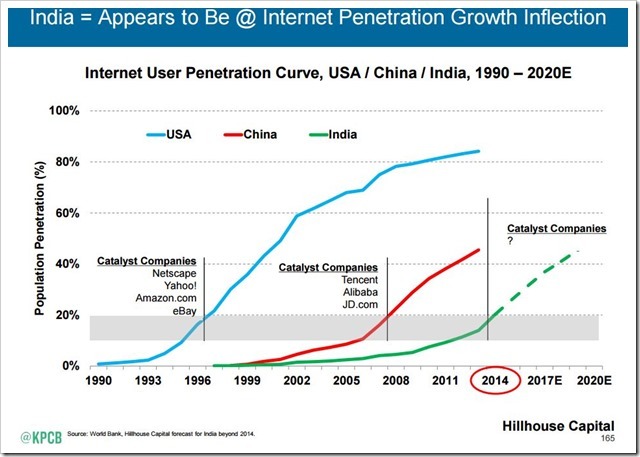 Mary Meeker’s Internet Trends Report Confirms India On Cusp of Internet Penetration Explosion! Mary Meeker’s annual internet trends report is one of the most awaited globaly due to the deep insights the report provides. Every year this Kleiner Perkins Caufield & Byers executive brings out some very interesting data points in mobile and internet space. This time, it is no different. 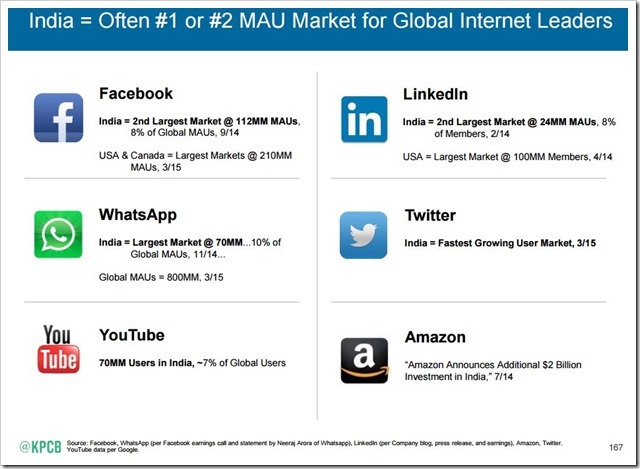 Infact, in the 2015 Internet Trends report, Mary Meeker has focused separately on India as China as two leading future Internet markets of the world. Here are 7 slides from this report that confirms India being on the cusp of mobile led Internet explosion. Lets take a look. The slide beautifully shows how Internet penetration has progressed in India. We are currently in the same position as China was in 2008 and USA was in 1996 as far as Internet penetration goes. In the US, the catalyst companies for internet growth were eBay, Amazon, Yahoo and Netscape, whereas for China they were Alibaba, Tencent and JD.com. While Mary Meeker did not mention any companies for India, it is quite clear that eCommerce companies like Flipkart, Snapdeal and Amazon are leading the cause. Another interesting thing to note from the above slide is – the Internet revolution in India and China started around the same time around 1997-98, however China’s inflection came 7 years earlier than that of India. While India is still far behind when it comes to number of Internet users (pegged at 232 million)compared to USA and China, it was the top country for new user additions at over 63 million users in 2014. The new internet user growth is only going to accelerate from here on. The growth in India clearly reflects on various popular Internet sites and Social media platforms. On platforms like Facebook, WhatsApp, Linkedin, Youtube and Twitter, India remains among the top 2 countries for user base. With 65 percent Indian internet traffic coming from mobile, it wouldn’t be wrong to say that, for India, mobile has been their biggest driver. India’s internet growth is actually driven by mobile rather than desktops and PCs. While Nigeria has a higher percentage of population accessing internet through mobile, they have a very small internet user base. 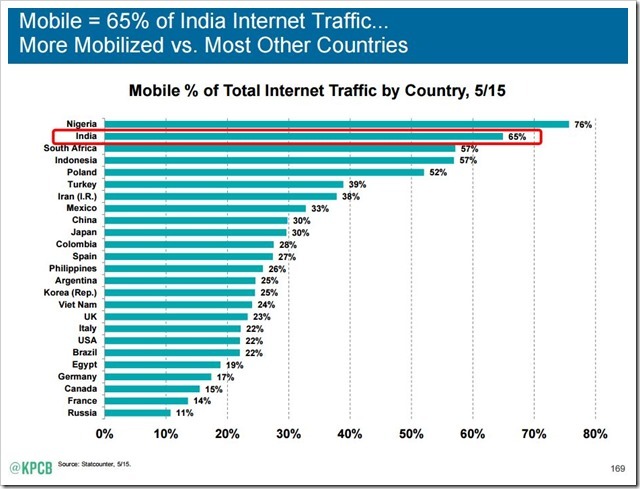 Among large countries, India remains far ahead of others when it comes to mobile internet traffic. In comparison, China has 30% internet traffic led by mobile, while in case of US it is only 22 percent. There is a reason why every ecommerce company is pushing their mobile apps. 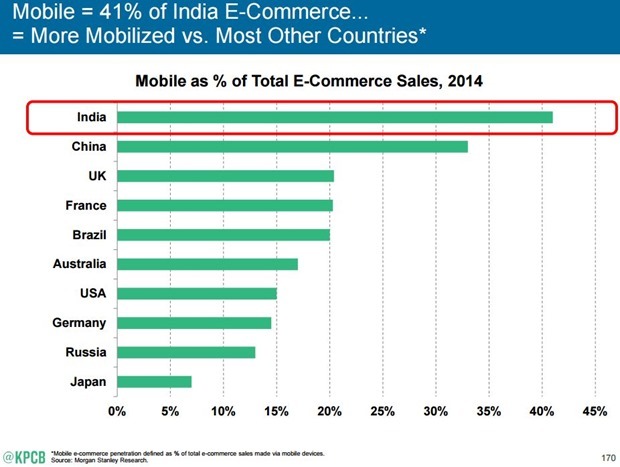 Nearly 42 percent of all ecommerce sales in India are happening through mobile, highest of any other country in the world. With 26 percent, China lags behind India. Only 15 percent of ecommerce sales in US are done through mobile! 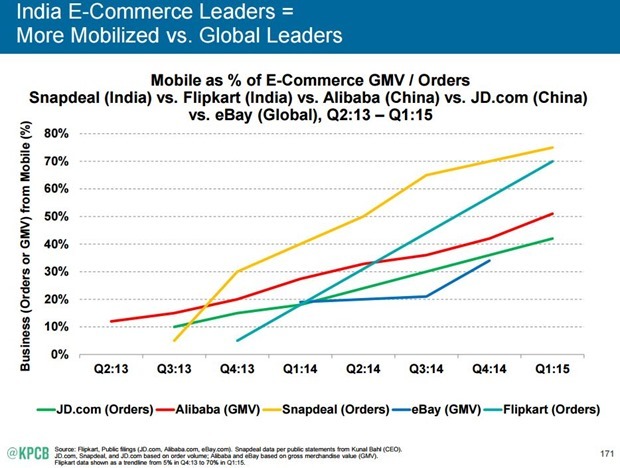 Mary Meeker has dedicated a slide in her report to Ecommerce companies in India, and interestingly, she has put Snapdeal ahead of Flipkart when it comes to share of orders placed through mobile phones. With nearly 75%, 1 in 3 orders on Snapdeal are done through mobile, whereas same percentage for Flipkart is 70. In China, the percentage of GMV through mobile stands at 51% for Alibaba and 42% for JD.com. Interestingly, Mobile wallets have grown drastically over past year or so, with Paytm nearly monopolizing this market. The report cites 17X growth in Paytm users to 80 million! The 2nd placed Mobikwik has less than 10 million users. From our perspective, when it comes to eCommerce, Mary Meeker report seems to have got a few things wrong. According to Snapdeal’s own admission they get half of their orders through mobile, whereas Flipkart has those numbers far higher. Also, in terms of digital wallets, Paytm has less than 70 million users. Also, there seems to be no mention of freecharge, which is a leading mobile wallet in India. Meet TARS, Your WhatsApp Based Personal Assistant!